There are some fancy names for what I will be teaching in my workshop on April 20th (click here for more information on this workshop), Ambient Mode Music Therapy, psycho-neuroacoustic therapy and many more. But Sound work is an ancient practice that science has proven to be highly effective in creating a relaxed state. Being free of a "fight, flight or freeze" response or anxiety is the beginning of positive shifts and movement. As one instructor of mine is always saying, "movement is life." Harmonics music or sounds can help you to naturally pacify your nasty internal stories and conditioning. Click here for a short post on your Brain's Negativity Bias My day started with feeling off, in a funk. Immediately, I went up into my head and started searching for all the reasons I might feel this way. Of course, your mind will oblige and create all sorts of reasons to match your feelings. Mental stories then feed negative emotions which in turn feed more negative perceptions and thoughts. As many say in my field, "when you are in your head your dead." When I noticed that I was getting up in my head, I sat briefly with my feelings, often that will create a shift. 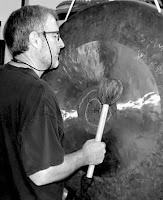 But today it didn't, so I went over and stood in front of my gong and and played a low drone for about ten minutes. I could feed the my mind quieting down and the sound beginning to wash over me and to create a shift in my feelings and thoughts. To be clear, playing for ten minutes didn't get me to a state of bliss. But it did create the movement that shifted my energy. Sometimes, that is all we need. Something to wash over us and to create a shift. Everyone doesn't have a 32 inch Sun Gong in their living room. This workshop is about teaching you the various instruments, harmonic sounds and recordings that can create a similar shift. Click here Three Gongs For more information on Brainwave Music and recordings that can be helpful click on this link to go my post on "What's In Your Wallet: Stress and Music"